Careers that are nurtured in the heart of a family business are rare these days, especially when the product is artisanal. Shilo Rapp is a rare bird indeed, one who took a circuitous route that led to his emerging position as one of Canada’s foremost designers. The proof of Shilo’s success as a designer is that Rapp Eyewear frames sell competitively alongside those from other leading-edge designers in the Rapp Optical store, where prototypes are also consumer tested. The company sells its frames around the world, showing them annually in New York and Paris, taking orders based on samples and making the frames when they return from the show. “We don’t keep stock,” notes Mel. 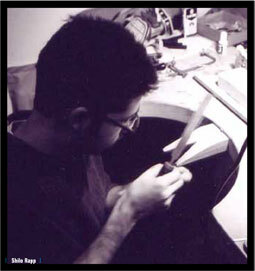 Technical innovation is a hallmark of Rapp Eyewear. They have an intensely perfectionist ethic, having (as just one example) worked for years just to refine their riveting process and get the correct pantoscopic tilt. With Rapp Eyewear frames selling big time into Japan, Korea, and China – markets better known for exporting than importing – in addition to France, Israel, Holland, Spain, Australia and the U.S., there is no doubt that Shilo Rapp is achieving his goal and will, over time, become more used to the accolades that accrue to high achievers in eyewear design.